See how these enhancements can benefit you. Your life doesn’t happen at a desk. It happens on the move. That’s why we’ve added some great new features to our mobile app and mobile web experience. It starts with a simpler, cleaner new look and touch navigation. View a summary of your equity awards and get detailed breakdowns. Access your equity and view the details of your awards. Use the Vest Date view to see the total value of your vesting shares. Review the details of each employee stock plan purchase. 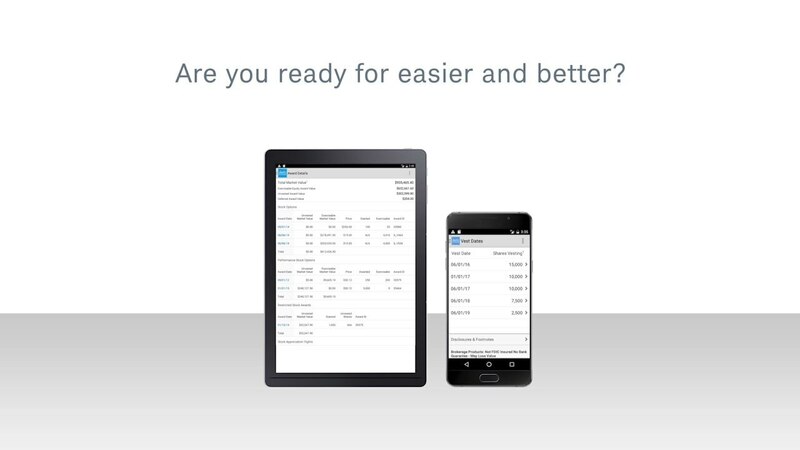 Are you ready for easier and better? Only iPad®, iPhone®, and Android are supported. Apple, Apple Pay®, the Apple logo®, iPhone, iPad, Apple Watch®, and App Store are trademarks of Apple Inc., registered in the U.S. and other countries. Amazon, Kindle, Kindle Fire, the Amazon Kindle logo, and Amazon Appstore are trademarks of Amazon.com, Inc. or its affiliates. The Schwab Mobile Deposit™ service is subject to certain eligibility requirements, limitations, and other conditions. Enrollment is not guaranteed, and standard hold policies apply. Please see the Schwab Bank Deposit Account Agreement for details on making deposits directly into your Schwab Bank account. Charles Schwab & Co., Inc. and Charles Schwab Bank are separate but affiliated companies and subsidiaries of The Charles Schwab Corporation. Brokerage products and services are offered by Charles Schwab & Co., Inc., member SIPC. Deposit and lending products and services are offered by Schwab Bank, member FDIC and an Equal Housing Lender. By clicking Proceed to Apple App Store, you will be taken to the App Store website. Apple is not affiliated with Charles Schwab & Co., Inc., and Apple is solely responsible for the content and information provided on its website. By clicking Proceed to Google Play for Android, you will be taken to the Google Play Store website. Google Play is a service provided by Google Inc., and is not affiliated with Charles Schwab & Co., Inc. Google is solely responsible for the content and information provided on its website. By clicking Proceed to Amazon Appstore for Android, you will be taken to the Amazon Appstore for Android website. Amazon Appstore for Android is not affiliated with Charles Schwab & Co., Inc., and Amazon is solely responsible for the content and information provided on its website. †Only iPad, iPhone, and Android are supported. The Schwab Mobile Deposit™ service is subject to certain eligibility requirements, limitations, and other conditions. Enrollment is not guaranteed, and standard hold policies apply. Click here for mobile deposit details. Options carry a high level of risk and are not suitable for all investors. Certain requirements must be met to trade options through Schwab. Please read the Options Disclosure Document titled "Characteristics and Risks of Standardized Options." Multiple-leg options strategies will involve multiple commissions. With long options, investors may lose 100% of funds invested. Covered calls provide downside protection only to the extent of the premium received and limit upside potential to the strike price plus premium received. Spread trading must be done in a margin account.